The dog sits in the back of the old dented Jeep, rust showing here and there under the dark green paint. The dog’s owner took off the top the first sunny day of summer and will forget about it until the rain comes in the fall. The dog is big and rangy with long fur in the black-and-tan saddle pattern of a German shepherd, and has upright ears that point in the direction of what he’s listening to. He pants in the shade under the purple-leafed plum tree where his owner parked the Jeep in the Fred Meyer parking lot. It’s a big lot with plenty of action. People pull into it, park their cars and go into the store while others come out of the store pushing noisy shopping carts across the broken pavement and load up the backs of their SUVs. The dog watches it all; the closer the action, the more intense his gaze. The Jeep is his, along with the empty parking spaces on all sides of him. If someone parks next to the Jeep, he barks at them when they open their car doors to get out, and they go find another spot to park. He has learned that if he barks, people give him space, and he likes space. When he has space, he can relax. With no one near him he won’t have to ward off unwanted advances to pet him because he looks cool. He likes having his neck scratched if he’s relaxed, but he doesn’t relax if he doesn’t know the person, and scratching is more than just a person running their fingers through his fur, it’s about the trust that has been built prior to the scratching and that’s confirmed every time it’s done. His view on the world is all about trust. There are people he can trust, and people he can’t, all based on patterns he’s experienced in their behavior. It’s in these patterns that he understands what trust is. Strangers are unpredictable because no pattern has been established and thus they can’t be trusted, only barked at. People he knows do the same thing again and again, sometimes fun things, like when his owner gets the cheese out of the fridge, and other times not so fun, like when he gets the nail clippers out of the dog drawer. But he goes along with the nail clipping because it has been a long time since his owner quicked him. He used to hate and fight it, now he simply dislikes and tolerates it. And there’s cheese afterward. As he sits in the back of the Jeep, he’s aware of more than just what he sees. There’s the scent of another dog drifting toward him from the open window of a minivan parked a few rows over. He’s heard it bark a few times and can tell that it’s a small dog and not very relaxed being left alone. He doesn’t mind being left alone. His owner will be back because that’s the pattern. There’s also the scent of a cat that passed through the lot a few hours ago and he’d like to jump out of the Jeep and track the scent trail to where the cat is now and make the cat run so he could chase it. Chasing things that run is fun. Bees, flies, squirrels, opossums. When they run it flicks a switch in him and he’s got to chase. But he doesn’t jump out of the Jeep because that would change his owner’s pattern. He gets to go in the Jeep because he stays in the Jeep. 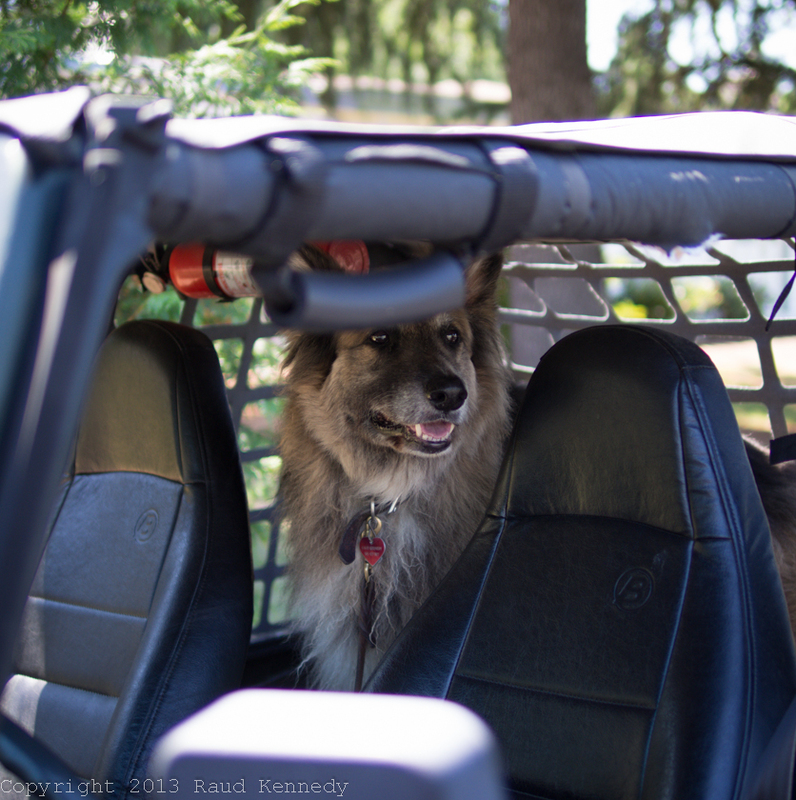 If he doesn’t stay in the Jeep he doesn’t get to go in the Jeep, a sort of half-freedom, but that’s the deal they’ve made, the pattern that’s been established. Much in the dog’s life is based on half-freedoms. He gets to run free in the yard, but it’s fenced. He gets to go on walks without his leash, but he has to stay close to his owner and come when he’s asked. But he’s used to this concept of half-freedoms because it’s similar to playing with other dogs. He can get rough and bark and growl, but when the other dog suddenly stops and sniffs the grass like it’s the most interesting thing in the world though they both know it’s not, he pauses and lets his excitement drop to a more manageable level. The dog’s gaze keeps returning to the store’s entrance—the last place he saw his owner. Now he spots him come out pushing a cart across the lot. Carts are good. Carts mean food. Carts mean chips and salsa, his favorite. Carts are part of the patterns in his life. Next, he and his owner will go for a ride in the Jeep. There will be lots of smells along the way and then they’ll be home and in the kitchen and there will be food and maybe some cheese. He likes sharp cheddar. He likes it a lot. Great inside view of a dogs thoughts. Just finished a book by Robert Crais called suspect, with a good part of it from the dogs perspective.